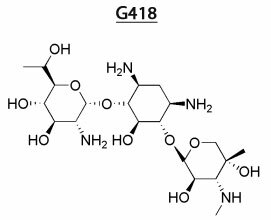 G418 is an aminoglycoside antibiotic similar in structure to gentamicin B1, produced by Micromonospora rhodorangea. G418 blocks polypeptide synthesis by inhibiting the elongation step in both prokaryotic and eukaryotic cells. Resistance to G418 is conferred by the neo gene from Tn5 encoding an aminoglycoside 3‘-phosphotransferase, APH 3‘ II. Selection in mammalian cells is usually achieved in three to seven days with concentrations ranging from 400 to 1000 μg/ml. Cells that are dividing are affected sooner than those that are not. pSELECT-neo-mcs, pSELECT-neo-LacZ : pSELECT plasmids offer all the features necessary to express a gene of interest at high levels in a large number of cell types. - pMONO-neo-mcs, pMONO-neo-gfp : pMONO plasmids are specifically designed for strong and constitutive expression of a gene of interest in a wide variety of cell lines. - pVITRO1-neo-mcs, pVITRO1-neo-GFP/LacZ : pVITRO allow the ubiquitous and constitutive co-expression of two genes of interest. - pVITRO2-neo-mcs, pVITRO2-neo-GFP/LacZ : pVIVO allow strong and sustained co-expression of two genes of interest in many tissues and organs. - psiRNA-h7SK G1 Neo : psiRNA-h7SK offer all the features necessary to express shRNA under the human 7SK RNA polymerase III promoter. G418 is provided as a colorless solution at 100 mg/ml. G418 is shipped at room temperature and should be stored at -20°C. G418 is stable for at least 1 year when stored at -20°C. Hygromycin B is an aminoglycoside antibiotic produced by Streptomyces hygroscopicus. It inhibits protein synthesis by interfering with translocation and causing mistranslation at the 70S ribosome. Hygromycin B is effective on most bacteria, fungi and higher eukaryotes. Resistance to hygromycin is conferred by the hph gene from E. coli. Hygromycin B is normally used at a concentration of 50-200 μg/ml in mammalian cells and 100 μg/ml in bacteria. - pSELECT-hygro-mcs, pSELECT-hygro-LacZ : pSELECT plasmids offer all the features necessary to express a gene of interest at high levels in a large number of cell types. - pMONO-hygro-mcs, pMONO-hygro-gfp : pMONO plasmids are specifically designed for strong and constitutive expression of a gene of interest in a wide variety of cell lines. - pVITRO1-hygro-mcs, pVITRO1-hygro-GFP/LacZ : pVITRO allow the ubiquitous and constitutive co-expression of two genes of interest. - pVITRO2-hygro-mcs, pVITRO2-hygro-GFP/LacZ : pVIVO allow strong and sustained co-expression of two genes of interest in many tissues and organs. - psiRNA-h7SK G1 Hygro : psiRNA-h7SK offer all the features necessary to express shRNA under the human 7SK RNA polymerase III promoter. 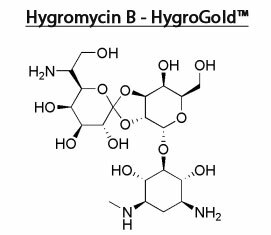 Hygromycin B and HygroGoldT are provided as 100 mg/ml yellow solutions. HygroGoldT is also provided as a powder. Products are shipped at room temperature. Store at -20°C. Hygromycin B solutions are stable for at least one year when stored at -20°C. Puromycin is an aminonucleoside antibiotic produced by Streptomyces alboniger. It specifically inhibits peptidyl transfer on both prokaryotic and eukaryotic ribosomes. This antibiotic inhibits the growth of Gram positive bacteria and various animal and insect cells. Puromycin can also be used in some particular conditions for the selection of E. coli transformants. Resistance to puromycin is conferred by the Pac gene encoding a puromycin N-acetyl-transferase (PAC) that was found in a Streptomyces producer strain. Animal cells are generally sensitive to concentrations from 1 to 10 μg/ml. Puromycin hydrochloride is provided as a colorless solution at 10 mg/ml. Puromycin is shipped at room temperature and should be stored at -20°C. Puromycin is stable for one year when stored at -20°C. InvivoGen is the sole worldwide producer of Zeocin™, a copper-chelated glycopeptide antibiotic produced by Streptomyces CL990. Zeocin™ causes cell death by intercalating into DNA and cleaving it. This antibiotic is effective on most aerobic cells and is therefore useful for selection in bacteria, eukaryotic microorganisms, plant and animal cells. Resistance to Zeocin™ is conferred by the Sh ble gene product which inactivates Zeocin™ by binding to the antibiotic. Zeocin™ is used at a concentration of 50-300 μg/ml for selection in mammalian cells and 25 μg/ml for bacterial selection. - pSELECT-zeo-mcs, pSELECT-gfpzeo-mcs, pSELECT-zeo-LacZ, pSELECT-gfpzeo-LacZ : pSELECT plasmids offer all the features necessary to express a gene of interest at high levels in a large number of cell types. - pMONO-zeo-mcs, pMONO-zeo-gfp : pMONO plasmids are specifically designed for strong and constitutive expression of a gene of interest in a wide variety of cell lines. - psiRNA-h7SK G1 Zeo, psiRNA-h7SK G1 GFPzeo, psiRNA-DUO : psiRNA-h7SK offer all the features necessary to express shRNA under the human 7SK RNA polymerase III promoter. Zeocin™ is provided as a blue solution at 100 mg/ml. 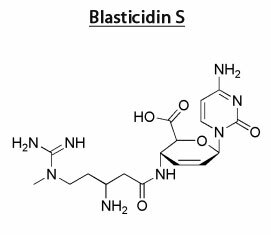 Blasticidin S is a peptidyl nucleoside antibiotic isolated from Streptomyces griseochromogenes. It specifically inhibits protein synthesis in both prokaryotes and eukaryotes by interfering with the peptide bound formation in the ribosomal machinery. Resistance to blasticidin is conferred by the blasticidin resistance gene from Bacillus cereus (bsr) which codes for blasticidin deaminase. Typically, bacteria are sensitive to blasticidin concentrations of 25-100 μg/ml, and mammalian cells to 1-10 μg/ml. - pSELECT-blasti-mcs, pSELECT-blasti-LacZ : pSELECT plasmids offer all the features necessary to express a gene of interest at high levels in a large number of cell types. - pMONO-blasti-mcs, pMONO-blasti-gfp : pMONO plasmids are specifically designed for strong and constitutive expression of a gene of interest in a wide variety of cell lines. - pVITRO1-blasti-mcs, pVITRO1-blasti-GFP/LacZ : pVITRO allow the ubiquitous and constitutive co-expression of two genes of interest. - pVITRO2-blasti-mcs, pVITRO2-blasti-GFP/LacZ : pVIVO allow strong and sustained co-expression of two genes of interest in many tissues and organs. - psiRNA-h7SK G1 Blasti : psiRNA-h7SK offer all the features necessary to express shRNA under the human 7SK RNA polymerase III promoter. Blasticidin is provided as a colorless solution at 10 mg/ml. Blasticidin is shipped at room temperature and should be stored at -20°C. Blasticidin is stable up to 1 year when stored at -20°C. Phleomycin is a glycopeptide antibiotic of the bleomycin family, isolated from a mutant strain of Streptomyces verticillus. It binds and intercalates DNA thus destroying the integrity of the double helix. Phleomycin is active against most bacteria, filamentous fungi, yeast, plant and animal cells. Use of phleomycin is recommended for cells poorly sensitive to Zeocin™, i.e. filamentous fungi and some yeasts. Phleomycin resistance is conferred by the Sh ble gene from Streptoalloteichus hindustanus which encodes a protein that binds to phleomycin, inhibiting its DNA cleavage activity. Typically, phleomycin is used at a concentration of 10 μg/ml for yeasts and 25-150 μg/ml for filamentous fungi. Phleomycin is provided as a blue solution at 20 mg/ml or as a powder. Phleomycin is shipped at room temperature. Store the solution at -20°C and the powder at 4°C. Phleomycin is stable for at least 1 year when properly stored.